Cheryl was a founding member of the New York Mills Historical Society, and served as its first president in the late 1970’s. She is currently the village historian of New York Mills and President of The History Club, which she founded in Whitesboro in 1995. She is the club’s newsletter editor. She is also the founder, current secretary and newsletter editor of the General Daniel Butterfield Civil War Round Table in Whitesboro. She is a member of the American Legion Auxiliary of the Arthur Moran Post #66 in Camden, New York, as well as an honorary member of the Memphis Belle Memorial Association of Memphis, Tennessee. She is known around the central New York area for presenting a number of historical lectures (89 to be exact!) on topics from the Titanic to the first moon landing in July 1969. 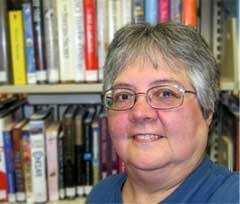 Cheryl was elected “Historian of the Year” by the Oneida County Historian’s Association in 2006. In 2010, she was listed in Who’s Who In America. She is an author, having written on Irish immigrants to the Utica area in a book entitled Ethnic Utica, published in 1994 by Utica College. With her brother, she is co-author and co-editor of a book on the Civil War regiments from Oneida County, which was published by the Eugene Nassar Ethnic Studies Department of Utica College in November 2010 entitled, With Courage and Honor: Oneida County’s Role in the Civil War. She is a contributing author, co-editor and served as proofreader for The Polish-American Encyclopedia, published by McFarlane Publishers in January 2011. For her work on the Encyclopedia, she has just been awarded the Polish-American Historical Society’s Distinguished Achievement Award. She is author of a novel, the first in a proposed series of at least four books about Eighth Air Force bomber crews in World War II England, titled The Children’s Crusade, published November 2011 by Whitehall Publishing. Her second book in the series, titled The Ragged Irregulars, is due out in the spring of 2012. She has traveled extensively all over the United States, having visited 45 of the 50 states, as well as trips abroad to Canada, the Bahamas, England, Finland, Hungary, Czechoslovakia, Poland and Russia. Cheryl is the daughter of the late Winifred and Stanley Pula of New York Mills, and sister of Dr. James Pula, a professor at Purdue University North Central in Indiana, himself a well-known local author and lecturer. Her mother was the confidential secretary to the principal of New York Mills High School for almost thirty years, and her father was a foreman for Oneida Ltd. Silversmiths in Sherrill, New York. She is the granddaughter of Amos and Lillian Platt Smith, and Jan and Katrzyna Tuman Pula. Her grandfather Amos Smith, was a popular streetcar conductor and operator of the last street car to make the run between Utica and Oriskany. Her grand uncle, Michael Tuman, was the president and organizer of the first worker’s union in the textile mills in New York Mills.